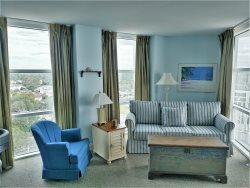 Verandas 1004 is a breath of fresh air in the midst of endless oceanfront options in North Myrtle Beach. Enjoy the Ocean Drive Difference by starting your vacation immediately upon arrival, as this property comes with fresh bed linens/bath towels, the beds are already made up for you, and the departure maid service are all included in your price. Nestled in the Ocean Drive section just a short walk from Main St, this 3 bedroom, 3 bath unit features upgrades like new vinyl flooring, tile, upgraded furniture, a giant master bath, wonderful ocean views and a balcony where you can unwind and lose yourself in the sound of the surf and fresh sea air. The fully equipped kitchen has been updated with granite counter tops, stainless steel appliances, and cusom cabinetry. The living room makes a great gathering place for your guests with comfortable sofa and chairs, and flat screen TV. With room for 8, this condo is large enough for the entire family or a few couples. Perfect for summer weekly vacations, SOS events, off season mini vacations, and winter monthly rentals. You will love this upscale slice of OD! Guests of Verandas 1004 will enjoy unlimited access to the on-site pool, hot tub, and lazy river as well as free parking for 2 vehicles and wireless internet. Book your stay today!